Step back in time to the golden era of music where the jukebox roared and feet didn’t touch the floor. Get your dancing shoes at the ready, grab yourself a milkshake and relax – you are in for an evening of back to back hits from the 1950s and 60s! Performed by a full live band, featuring some of the country’s top musicians, this incredible show features excellent vocals, tight harmonies and an infectious sense of fun. Grab the opportunity to see Lipstick on your Collar, at a Venue near you soon, and you really won’t be disappointed. This is an unforgettable experience and the endless standing ovation at the end of the night is proof that these Rock ‘n’ Rollers can really raise the roof – Rock ‘n’ Roll is here to stay!!! 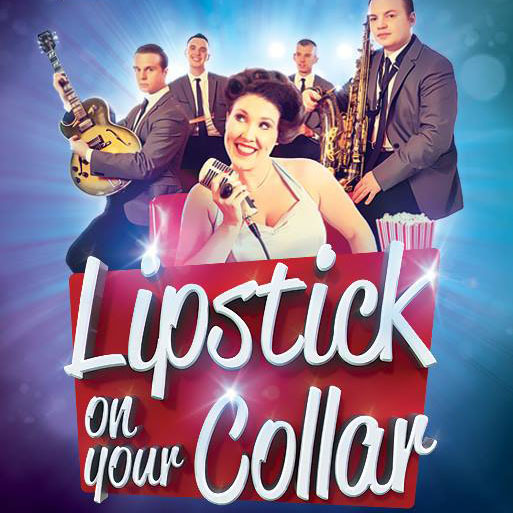 Lipstick on your Collar is far more than just a Show – it’s a true Rock ‘n’ Roll Experience of the highest 5 Star quality and one definitely not to be missed!!! If you love Rock ‘n’ Roll and want to go on a fun filled journey back to the 50’s & 60’s then let Nikki and the boys take you there. With her pitch perfect vocals, happy-go-lucky charm and the band’s brilliant, flawless musicianship and tight harmonies, – it’s a one-way trip!! With hands clapping, feet tapping, singing along and dancing to so many golden oldies, you’re swept away to another world – so much so that you won’t want to return to the present day I can assure you!! Buckle up and hold on tight as you’re transported on a fun filled musical journey spanning ten years of brilliant Rock ‘n’ Roll. This truly authentic and exhilarating production is guaranteed to impress! !